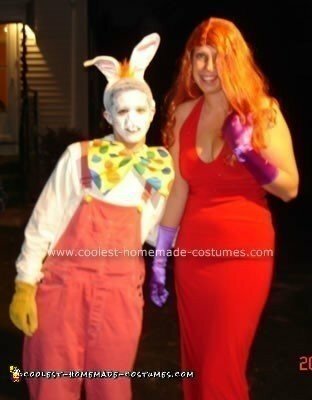 Our favorite movie from the 80’s was “Who Framed Roger Rabbit?” We have been doing couple’s costumes for a few years now, and each year at the parties we go to, the people there tell us how we have to come up with something good again for the next year. Well, this year, we wanted to do something really different than what you would normally see, and since he is shorter than me, we thought that the Roger Rabbit theme would be funny and original. I made the costumes myself, going around to various thrift shops. I found the overalls for Roger at a thrift shop, and when I bought them they were khaki, and I ended up dying them red – what a project! Roger’s feet are actually women’s slippers. I tied orange “hair” around the bunny ears, and spray painted his hair white. The bow tie I found as part of a clown costume – works perfectly! I painted his face white, and gave him a bunny nose with teeth. He is wearing yellow gardening gloves. For my Jessica Rabbit costume, I found a red dress at a thrift store that was perfect! I purchased the purple gloves on the internet, and the shoes at an “adult” store. I purchased a red wig. I also sprayed glitter spray on the dress to give it that Jessica Rabbit gleam. I put on my heavy purple eyeshadow, and we were ready to go! Really good! The dress is amazing!! Well done! I am very happy to see these costumes!